This property's price has dropped from £875,000 to Offers in excess of £800,000. 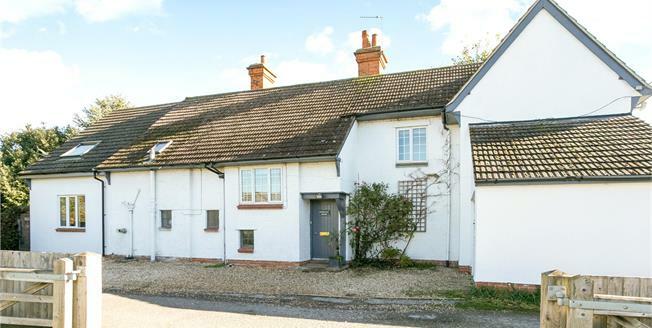 A spacious and most attractive extended and renovated period property, located in a tucked away situation in the sought after village of Chilton. There are some lovely period features throughout including beamed ceilings and wooden floor boards. An entrance hallway leads to all reception rooms. There is an open plan, light and airy spacious kitchen/diner which is the heart of the house with doors onto the patio and enclosed rear garden. A useful utility room adjoins the kitchen and there is a separate cloakroom. There are two further reception rooms, both with fireplaces, including an exceptionally generously sized double aspect sitting room which is most attractive. There is access from the kitchen to a cellar which is useful for storage. On the first floor there are five bedrooms and three bathrooms, two with en suite facilities. The master bedroom has an additional mezzanine floor/gallery as well as a small dressing room and ensuite bathroom. The house is decorated in neutral tones and has a good deal of natural light with a lovely welcoming feel. The village of Chilton has many historical and architecturally interesting period buildings including a beautiful parish church, village shop and pub. A wider range of shopping and other facilities including restaurants and cinema can be found at nearby Didcot and the larger town of Newbury whilst the city of Oxford offer a wider range of all shopping, dining and social amenities. There is a primary school in the village and Bargeway House is within the favoured Downs School at Compton catchment area. There is an excellent range of state and private schooling in the area including the Europa School at Culham. Preparatory schools include Cothill, Chandlings Manor, The Manor and senior schools include St Helen & St Katherine’s and Abingdon School as well as the wide range of schooling in Oxford. There is a main line station to London Paddington at Didcot Parkway (approximately 5 miles). A34 and M4 J13 road links are excellent. There are numerous walks and bridleways locally, including the stunning landscape of the Ridgeway, to appreciate the surrounding countryside. Externally, there is a good sized enclosed rear garden which is quite delightful with mature shrubs and trees and which is mainly laid to lawn. To the front there is a gravelled parking area which provides parking for three cars and a single garage. The property also has the benefit of solar panels. Mains water and electricity. Oil fired central heating. Solar panels.